SMS (aka text messaging) allows you to send text messages to mobile phones. This feature is great for sending one-off ad hoc messages for Customers, or using the automated processing functions offered by Storman to automatically send SMS messages to Customers - for example, Customers that are late in paying their bills. Storman clients that use SMS for warning late-paying Customers of impending lockout have informed us that the tool is very effective. In most cases, they said they'd received a call from the Customer wishing to pay the bill over the telephone via credit card a few minutes after having received the SMS. During the below process you will be setting up Storman SMS services. 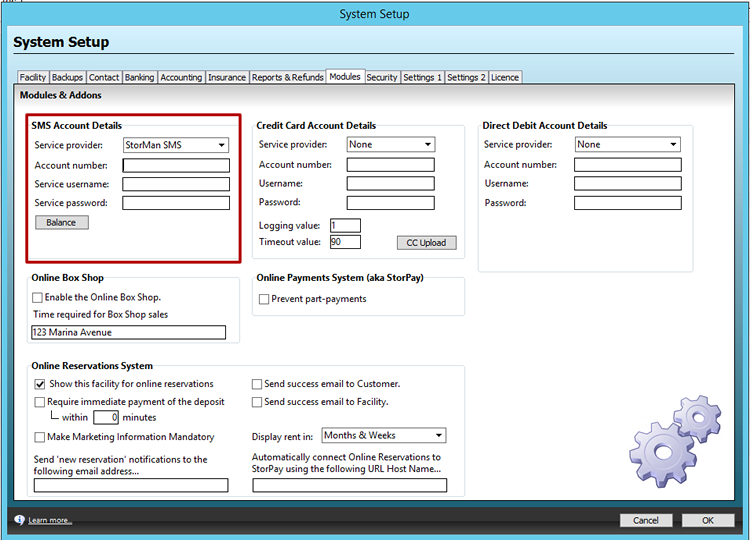 Navigate through the Maintenance menu to System Setup. Account Number. This will be provided to you by Storman when signing up. Service username. This will be provided to you by Storman when signing up. Service password. This will be provided to you by Storman when signing up. Select OK to close and close the window. Test to see if they setup was successful by temporarily changing a customer number on their agreement and send yourself a message.